Recessed fixtures have become a standard part of home interiors. Since the 1990s, people have been stuck with what I call the "contractor’s special," which is a grid of 6-inch-diameter downlights per room. Gradually, in the 2000’s, they became four-inch-diameter downlights. This is not what I would call a huge improvement. Recessed fixtures alone do not make a lighting design. They are only one component. You need other sources of illumination in order for the design to be successful. Downlights are often used for general illumination but unfortunately, they're not very good at it. They do provide an even spread of illumination on the floor, but who’s working or entertaining on the floor? Okay, don’t answer that question. Fill light for a room is best achieved when bounced off the ceiling. This indirect light provides an ambient layer of illumination, and is more complementary for people’s faces. Recessed fixtures aren’t really good task lights either. When you lean in over your desk or kitchen counter your own head creates a shadow onto the work surface. 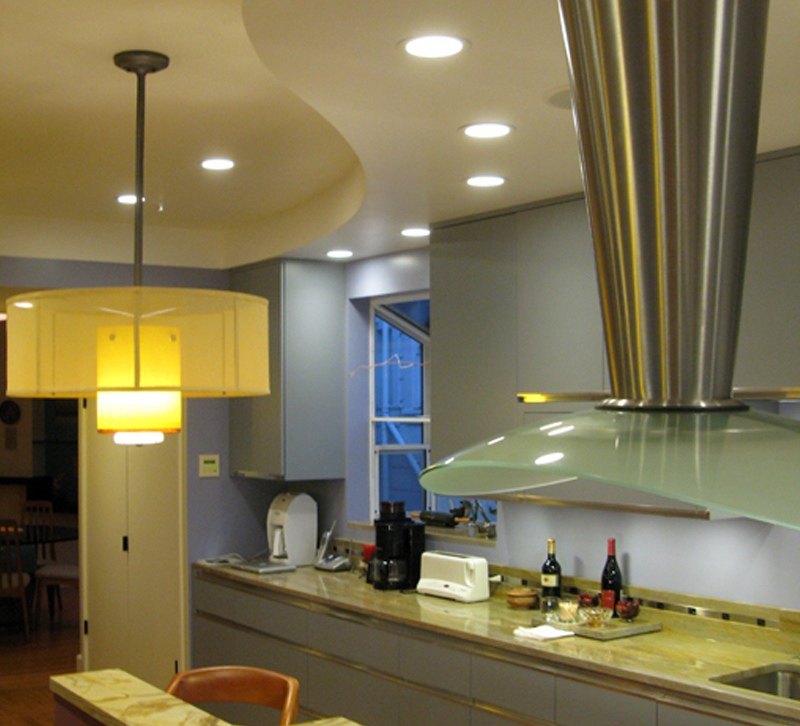 The best task lighting comes between your head and your work surface. That’s why undercabinet lights in the kitchen work so much better. 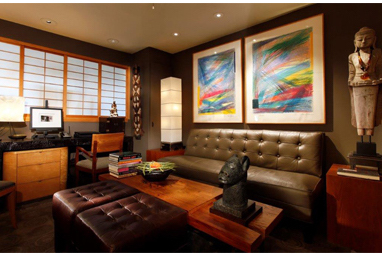 What they can be good at is accent lighting, projecting light onto tabletops, plantings and artwork. This works best when the fixtures are adjustable so that they can be directed. Even if your recessed fixtures already exist, there are often different trims that can be installed that turn a fixed downlights into a recessed adjustable light source. This does bring up the question of trim selection. Many of the recessed fixture housings on the market are termed universal, which means there are many different kinds of trims it can fit into an existing or new housing. Often, the choices can be overwhelming to homeowners, as well as architects, interior designers and contractors. The question often comes up for fixed downlights as to whether to use a white reflector or a black reflector. White reflectors disappear nicely during the day, but can be quite glaring at night. Black reflectors, along with other metal finishes like nickel or pewter, help ameliorate glare at night but look like dark holes during the day. My no. 1 recommendation, of course, is to specify adjustable trims. This gives you a lot of flexibility as to where the lighting can be aimed. If you insist on fixed downlights fixtures, here are a few things to consider: First off, pick a trim that allows you to recess the bulb as far back as possible into the housing. This reduces glare. I would then recommend pewter or nickel reflector, paired with a decorative trim that draws a little bit of attention and produces just a bit of fill light. 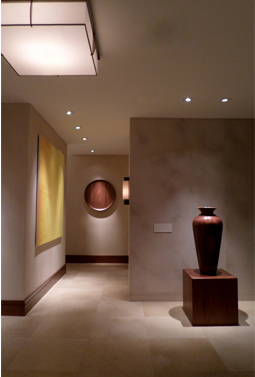 In this room, existing housings were retrimmed to turn them into adjustable recessed fixtures. Another recessed fixture was encased in a translucent box, turning it into a decorative ceiling mount fixture. Interior Design by Kristi Will Design and photography by Randall Whitehead. Another thing you might consider, especially if the recessed fixtures already exist, is to install a decorative fixture over the recessed downlight. Companies like Recesso have a whole line of ceiling-mounted decorative fixtures that use the existing recessed fixture as the source of illumination. They are easy to install and do not require an electrician. If you’re starting from scratch and want to install recessed fixtures. I would have you consider installing all recessed adjustable versions which can act as downlights, wall washers or accent lights. Four-inch-diameter recessed fixtures with adjustable trims highlight the art, sculpture and tabletop without drawing too much attention to themselves. Interior design by Turner Martin Design and photography by Dennis Anderson. Right now, I’m leaning towards housings and trims which accommodate line voltage (120V) LED GU10 MR16 bulbs. These bulbs come in a nice variety of beam spreads and color temperatures and don’t require a transformer or driver which makes the fixtures is pretty reasonable. Pick a trim that has a very small aperture, so that they draw very little attention to themselves in daylight or evening situations. Let all the focus be on you. I strongly feel that you should be the star of your own home, as I am in mine. Other Announcements, Events and Deals from Kentucky Lighting & Supply, Inc.
A. Kentucky Lighting & Supply, Inc.